1. Host a fun and enjoyable contest – You will know a lot more about hosting an eating contest once our “Hosting A Contest” section is available, but make sure to set the contest up so that it is fun and enjoyable for everybody. Don’t make unnecessary restrictions and do not charge contestants a high entrance fee (unless it is going to a charity organization). Make sure to put effort into the event and try to keep it organized. Having a fun event definitely feeds the movement because it gets people excited about eating contests and some people may want to do more afterwards. If you link your contest to a charity organization that genuinely relates to you or somebody involved with your restaurant, this will put an even more positive spin on the event which will attract even more people and contestants. Another important thing to do is to be sure the results are accurate and that things are not biased. This happens mostly during contests that must be weighed rather than counted. Rigging the results can potentially upset a lot of people, especially the eaters, which will make everyone look bad. 2. Use the resources on FoodChallenges.com – We currently only have the manpower and ability to promote food challenges, so there is no spot to post or list your eating contest on our site yet. With that said, it would still be very beneficial to join the community and become a member (it’s free) so that you can contact and communicate with eaters that may be interested in your eating contest. Create a simple online profile (you must start the registration process on the homepage inside the top red banner), and make sure to list yourself as a “promoter” so that eaters will know what you are when you contact them. You can search for eaters in and around your area that may be interested in your eating contest by using the Find An Eater application. Contact those eaters that you find and message them to see if they are interested in your eating competition. If your contest involves cash prizes for winning, you may want to contact eaters within a few hours of your location too. Make sure to search all of the main cities around you. If you are looking to just have a smaller contest with no cash prizes that would make it worth traveling to, you should focus your efforts on only contacting eaters directly around you. Use the same profile to contact eaters and promote both your eating contest and your food challenge if you have one. 3. Promote your contest!! – This is an obvious one, but promoting your contest is the best way to get people thinking about your restaurant, the event, and competitive eating in general. Promote the contest via social media and post an advertisement around your restaurant. Contact the local news about your contest, and get as many people involved as you can. For now, check out some of the tips that we have in our Marketing A Challenge section. Those articles are geared more towards marketing food challenges, but they can also be adapted for marketing an eating contest too. Seek help from your followers on Facebook and social media, and ask them to share your eating contest with friends and family that they think might be interested. If your contest is set up well, they will most likely want to recommend it to people they know. Marketing and promoting an eating contest gets people that hear or see something about it to think about competitive eating, and some may even act on their impulses and get online to seek advice. That is definitely feeding the movement and very helpful!! 4. Recommend FoodChallenges.com to competitors – There is a 100% chance that absolutely nobody watching your eating contest is going to be hoping that the competition is extremely boring. If you want the competition to be exciting, recommend checking out our site and articles to all of the competitors that sign up in advance. We are the only website that people can go to and find competitive eating tips and strategies. By checking out the training articles, your competitors will be able to prepare for the competition so that they can perform at a much higher level than they would have without training correctly beforehand. This will lead to a more exciting eating contest for all of the spectators to watch and enjoy. Not only will this help grow our community, but it will also provide you with much better competitive eaters. Let’s all work as a team to #FeedTheMovement!! 5. Video the eating contest!! – This is definitely the #1 largest mistake that almost all restaurants and food businesses that host eating contests make, and that is not videoing the contest. In today’s busy world, many of your customers won’t be able to attend the actual competition and event, but that doesn’t mean they don’t want to watch it. Find somebody or have a company film and produce a video of the event!! Talk to your employees and friends, and find somebody that is pretty good at video editing. Even posting a raw (unedited) video is better than nothing at all, and it is very easy these days to find a digital video camera to use. A shorter, edited version of the competition will get more views, but you definitely need to document the contest so that you can upload it to YouTube (for free). By doing this, you will be able to share it with your customers and followers that were not able to attend the actual event. You will be further promoting your business and contest too, and the competitors the next year will be able to watch the previous year’s contest so that they can be more prepared. There are many benefits that will come from videoing your contest. Not only are you helping yourself, but you are also adding content for our competitive eating fans to watch, even a few years after the contest happened. 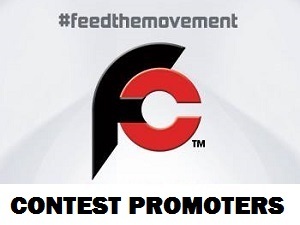 Thanks for reading “How Eating Contest Promoters Can #FeedTheMovement” & using FoodChallenges.com! !